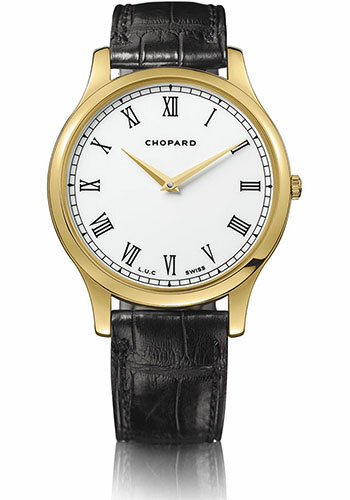 39.5mm 18K yellow gold case, white dial with Roman numerals, automatic self-winding COSC movement, approximately 65 hours of power reserve. Water resistant to 30 meters. 39.5mm 18K white gold case, black dial with Arabic numerals, automatic self-winding COSC movement, approximately 65 hours of power reserve. Water resistant to 30 meters. 39.5mm 18K rose gold case, white dial with Arabic numerals, automatic self-winding COSC movement, approximately 65 hours of power reserve. Water resistant to 30 meters.